Thinking Out Loud In Sturbridge: If You Do It, Do It Right. I am all for renewing what we have on Main Street. 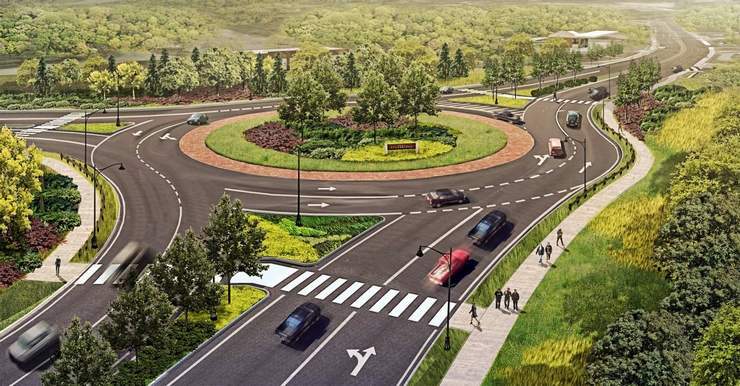 The current renewal plan is to include new sidewalks on both sides, street trees, new plantings, decorative lighting, a reconfigured intersection at the intersection of Stallion Hill Road, a crosswalk at the Host Hotel, and a roundabout at Route 131 and Route 20 with a reconfigured roadway, lighting, and plantings. A lot of renewal, and a lot of money - $13 million dollars, but let's face it, there is a need for a lot of that work to be done. I don't know how I feel about the roundabout. I have to work out just how that will make the traffic flow better, and make things safer than the lights that are currently in place, especially since other safety issues are not being addressed. The reconfigured Stallion Hill intersection is long overdue. The redesign is to allow traffic to turn left at the light, when heading west on Main Street, and onto Stallion Hill Road. This will be better for those heading to Old Sturbridge Village, and the shops at the intersection. New trees, plantings, pavers, reconfigurations, roundabouts, decorative lighting, a new crosswalk, sidewalks all designed to make the road more esthetically pleasing, and safer. $13 million dollars to be spent to make the changes happen. This will be a huge project. Another project this size won't happen for another thirty years so we may as get as much bang for our buck now. So, what's missing from this undertaking? Burying the utility lines. The road will be dug up, sounds like a great time to bury the lines. No amount of planting, and decorative lighting will hide the ADA noncompliance of the poles in the middle of the sidewalks, and their plain unattractiveness. Flowers, lights and trees are nothing more than lipstick on a pig unless those lines are buried. Traffic light at the intersection of Arnold Road, and Route 20. This should have been addressed years ago. Today, those leaving Arnold Road for parts beyond must wait, and wait for a kindhearted person driving on Route 20 to stop, and allow them to come out and onto Route 20. This can take a very long time, and as a result, people become impatient. This can lead to all sorts of problems. Traffic light at the intersection of New Boston Road, and Route 20. This is the most dangerous intersection town. Two lives have been lost there in recent memory, yet drivers must run the gauntlet each time they pull out of their road, and onto Route 20. If you are spending the money for a roundabout that is being touted as a traffic flow, and safety improvement, then why not take on the bigger issue 1/10 of a mile to the east. Tell me why these long time issues are not being addressed in this massive project. Give me something. An explanation as to why safety is a concern at one place, but not an issue elsewhere. Tell me why beautification of the roadway doesn't include removing the current monuments to ugliness. I would think that these improvements would be more affordable, and a heck of a lot easier to do while the road way is being redone. I don't miss much, and if I am missing something this time, please tell me what it is so I can begin to understand this plan better. Don't say it's money. This is Sturbridge, and recent history has shown that that is not a concern. Arnold Rd: current traffic volume does not meet state MADOT standards for a light ( yes I hear the groan) BUT Planning bd is looking into more detailed traffic study if light is installed how will that reduce traffic on Cedar St (via Cooper rd) IE: More cars on Arnold Rd with light. New Boston Rd: with round about, all traffic will turn right coming out of this street and use round about for turns. No crossing over lanes. These questions were asked over the last two public meetings and publicly answered. It looks like this plan is coming mostly in its current form. Judging by the meeting the other night it seems to be a done deal. There seems to be little opposition to it. There were a couple people that had some questions and some were answered some were not as seems to be the case in many matters. Money appears to not be an issue as the governor is going to release a lot of funds to pay for it. Shawn seems pretty certain of that. Its still my money that is paying for it. Nothing is free, the money comes from us one way or another. The intersections mentioned above do need to be addressed. I never go on New Boston rd and feel bad for people that use it, it is obvious that its a dangerous design. Maybe the round about will make it better, but who knows. I think was not really considered. It seems like Arnold road was thought about by Pare but that's about it. Considered but not really addressed. I have mixed feelings about the round about. Since we are locals it should not be much of an issue. The out of towners will make it a bit more interesting. Also, the trucks that will be using it should make it fun. I wonder how many additional signs will be needed on the right while heading west on Rt 20 before the round about. I have not counted how many signs there are between New Boston road and the intersection at 131, but there are a ton. How many more will be needed? The turtle sign should probably so away just sayin. Mr Supernaut (spelling)... Made some good points about the corridor. He seemed to know what he was talking about. What i would like to really see when it comes to route 20 is making it a quicker ride for all. Not having to wait for turns any longer than we already wait. If this plan makes it a better ride im all for it. If it does not then i have issues with it. I believe it was one of the Pare people who commented on the multiple people in wheelchairs she saw on Rt 20. In all my years i have never seen one person with a wheelchair tooling around on our sidewalks. I very rarely see anyone on the sidewalks at all. The majority of the times that i drive through the town from 148-131 on the weekends i do not see anyone at all. Maybe there will be 1 person coming from the apartments near the old subway going towards Cumbys but that's about it. Will many of the residents of the town park their car somewhere in town and stroll down main street shopping and dining? I guess it may happen but i don't really see it. These are just my observations from what i have seen and heard. I did not attend any of the meetings so i am guilty of not voicing my opinion to the proper forum. Its sorta like complaining while not voting. I hope the changes make our town better. We will be living with the changes for a number of years to come. I really hope that the people that do not agree with the proposal aren't shaking their heads for the next 20 years saying "I told ya so". Fingers crossed that its a success that does not cost us a dime more than we have already spent. The governor is going to give us back our money! The first problem I have with the plan is that there will be NO VOTE from the public on this issue until the ball is already rolling big time, after getting grants and whatever monies they can come up with. The matter will only come up for vote at an annual or special Town Meeting when they are looking for more money directly from US. Unless, that is, the question of burying the wires comes up first, and as you wrote Wally, (whether or not we want to pay to have that done) that does needs to be addressed first. By the way, I’m told that if the wires do get buried, the cost of that will be paid for by an increase in our electric bills. The cost of burying the wires has not been included in the $13,000,000 price tag for this project. I have been to just about every “working meeting”, in the past several months, as well as attending all of the public meetings. They have not really addressed New Boston Road to my knowledge, other than changing their minds about putting the intersection there. Our consultants, Pare, say they have done their own traffic study on Arnold Road, and they have concluded that a traffic light there is not warranted. You’re right Wally those places need lights. Here are but a few of my concerns about the proposed Route 20 work: The proponents say we are behind the times because we haven’t done the “street scaping” they envision – but why should we widen sidewalks up to 8 feet wide only to dig everything up again when we finally bury the electric wires and other lines later on. The thought of ADA compliance arises, but, at the last working meeting, the consultants said they would be moving some of the telephone poles back anyway, so why 8 foot wide side walks? Why are they asking for redundancy in getting to Old Sturbridge Village from Main Street? They tell us people can’t find the Village and it’s Motor Lodge. They’ve been finding the Village for 60 years. It hasn’t moved. What’s needed is better signage. The signs at the entrances to the Village and the Motor Lodge are not able to be read in bright sunshine, and at night. The smallish gold metallic lettering on those reddish brown signs glitters so much that the lettering is completely obscured. Their old white signs with good-sized black lettering were much more effective. An OSV arrow at the jug handle, and proper signage put up and paid for by the Village would solve the problem. Why eliminate the traffic signals at Routes 131 and 20? Those lights provide much needed little breaks in the traffic when vehicles attempt to leave the motel that is right there, as well as McDonald’s, The Host, The Oxhead, Yankee Spirits, Sal’s, the new Seafood place, etc. Why plant trees and plants in medians and other locations that even the consultants admit are not appropriate for healthy growth? Plants need watering and tending to. Who will care for them? At what cost? Will they be in danger of being struck while they work in the narrowest median strips? Why would we install new ornamental lighting, not acceptable by National Grid for the telephone poles? National Grid itself does provide other choices, if we insist on new lighting replacing what we already have. The lighting the committee wants would mean installation of ornamental poles in the medians, and across the street from the telephone poles. This would mean digging up the roadway in several areas, because we WOULD be required to bury those new wires for the ornamental lighting. Committee members complain about clutter now, so why add more “things”? Drive down to Southbridge and look at the Main Street in the center of town. They already have many of the things proposed for this project in Sturbridge. They have brick inserts in near the edges of their sidewalks. They have ornamental lighting. They have trees planted along and in openings in the sidewalks. Tree roots are damaging the sidewalks, and the granite curbstones are having problems. Some of the trees have died off and others look too large. Did street scapes bring them more business? It sure doesn’t look like it. At the last working meeting of the committee we were told by the Pare Professional Engineer that our sidewalks do need to be as much as 8 feet wide. As an example he used the area of Friendly’s, saying that the 8 foot width is necessary because of ALL THE PEOPLE who will be on those sidewalks. Why? What people? Where will they come from? Will they be walking from one restaurant to another or from one motel to another? Where will they be going on foot? Now route 20 traffic will be subject to this same concern in a roundabout. I moved from the "land of traffic circles", New Jersey. I go back there frequently as our children live there. Down there circles are thing of the past, and as major highways are improved they're are being eliminated together. Oh, you may see them in the quaint little towns. But I can't think of one major highway (and there are a lot of them) that use traffic circles at the confluence of multiple highways. I've often seen traffic heading west on 20 blast through the imtersection at 131when the lights are green. The only thing slowing lead footed drivers down is that light. The light also provides a brief break in traffic so traffic exiting all the business, from Bentley's to Sal's can make a break for it. With the traffic circle I foresee two things. 1) Westbound Rt. 20 traffic entering the circle won't have much of an arc to negotiate and will blast through the circle and speed west on 20 right past all of those businesses. 2) During the evening rush, you're going to see a much longer line of traffic headed west than you do now. Main Street needs metering lights, traffic signals that briefly halt traffic to provide breaks in the flow so waiting cars can get out of driveways and onto Main Street. During periods of light traffic flow, the lights are on flash. The best thing this consulting company could have done would have been to look at other developing areas, like South Jersey where I came from and use them as an example. Down there, there are definitely no new traffic in their highway improvements. Remember to use your FULL name when posting a comment, Bob. 😊. Please post it again.